We are completing a large lamp at the studio, so here is a second “lamp of the week’ presentation. The 28″ Poinsettia is the a generously proportioned shade that can be used as a chandelier, as an oversized table lamp, or on a Jr. Floor base. This example, commissioned in 2009 by a client in Chicago, features vibrant reds and greens. 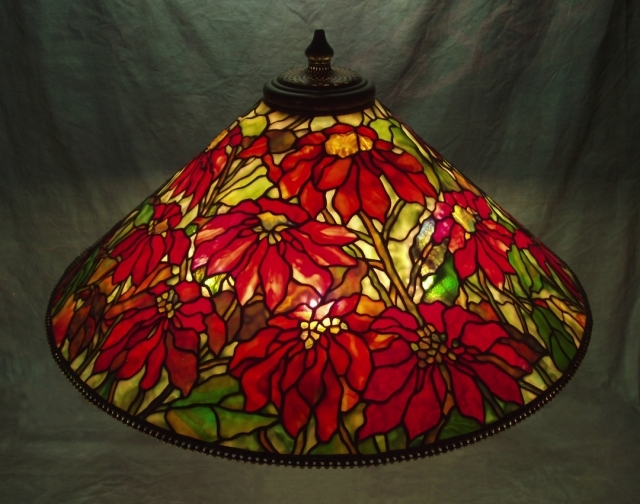 The 28” Poinsettia shade has a non repeating pattern, so the design looks different when viewed from every angle.